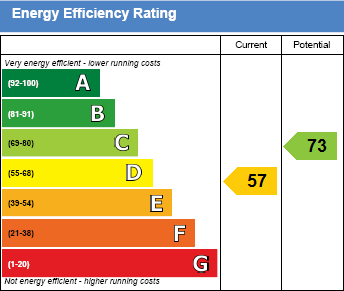 Mileages: Easingwold  8 miles, York  11 miles, Malton  10 miles (Distances Approximate). 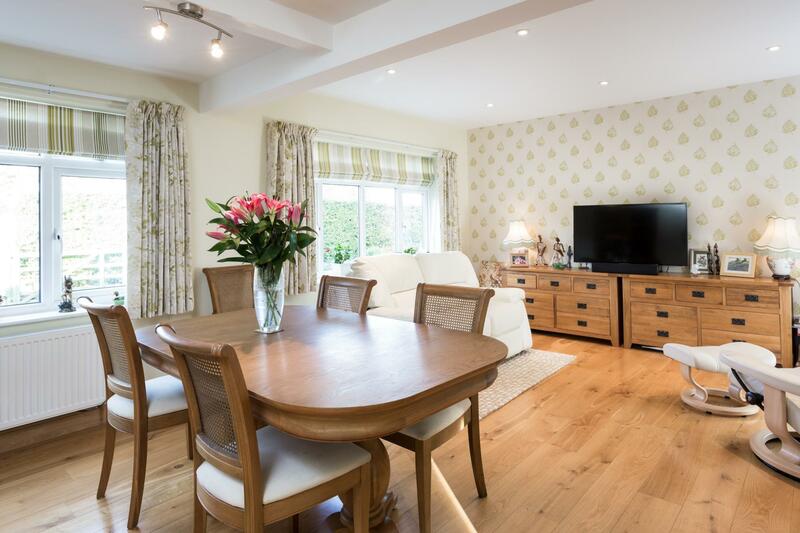 Enjoying a delightful mature private position with views towards the Castle, within this highly popular and accessible village, a substantial double fronted detached 4 Bedroomed Family Home, offering stylish and well proportioned rooms with an outstanding Living Kitchen, set within attractive well stocked gardens. 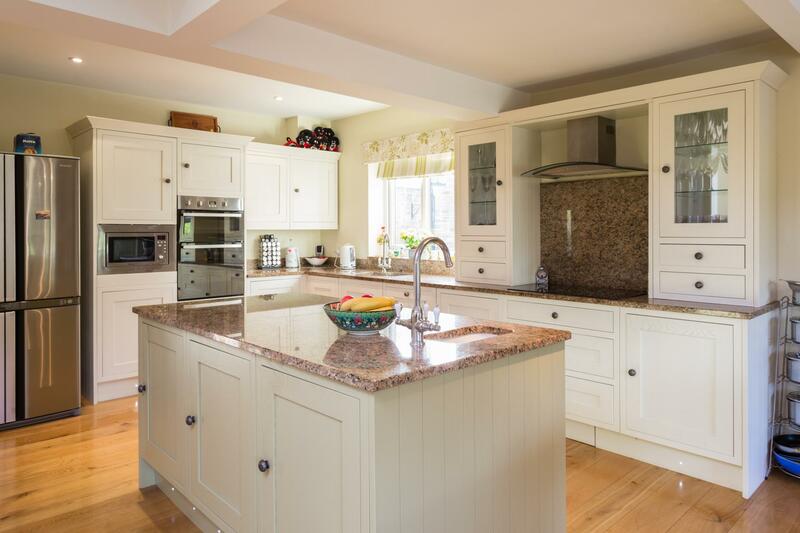 With Polished Oak Flooring, Cast Wood Burning Stoves, UPVC Double Glazing and Oil-Fired Central Heating. Staircase Reception Hall, Sitting Room, Garden Room, Living Kitchen, Utility Room, Cloakroom, Ground Floor Bedroom, Family Bathroom. First Floor Landing; Master Bedroom, En Suite Bathroom, 2 further Bedrooms. Gated courtyard with plenty of off-road parking, detached double garage, generous landscaped gardens. In all 0.20 acres. Approached over wide stone steps to a composite panelled ENTRANCE DOOR opening to a spacious RECEPTION HALL having 2 cloak cupboards. 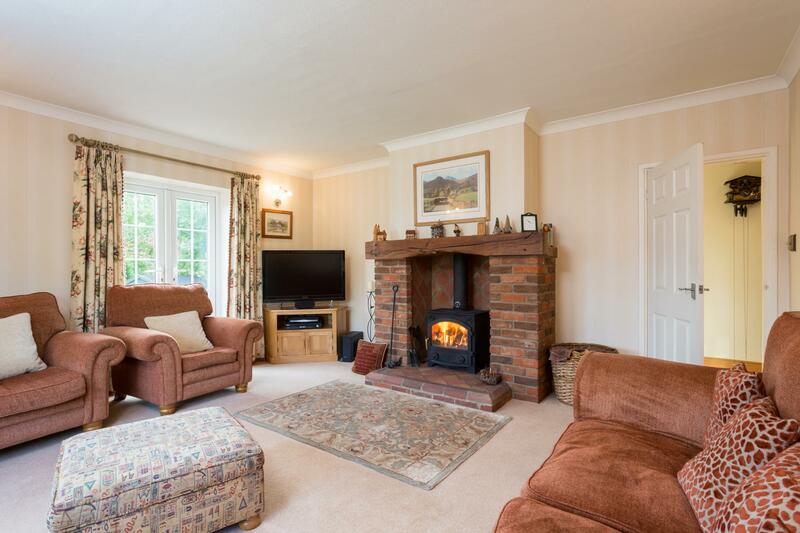 The SITTING ROOM is a delightful room, having a semi-circular bay window overlooking the attractive landscaped gardens, with an impressive clamp brick fireplace with broad wooden mantle and cast wood burner set on a quarry tiled hearth, with French doors opening onto a south facing patio. The LIVING KITCHEN extends to 25ft x 20'6ft overall and has been superbly fitted with a range of cream 'Shaker' style fittings comprising wall and floor cupboards and drawer fittings, complemented by granite preparatory work surfaces and upstands, central 5 ring induction hob with granite splash, stainless steel and glass chimney style extractor, flanked by glazed cabinets with drawers under, inset Villeroy & Boch ceramic sink unit with waste disposal, beneath a UPVC double glazed window overlooking the courtyard, integral microwave with adjoining double oven and cupboards above and below, corner carousel fitting and integral dishwasher. 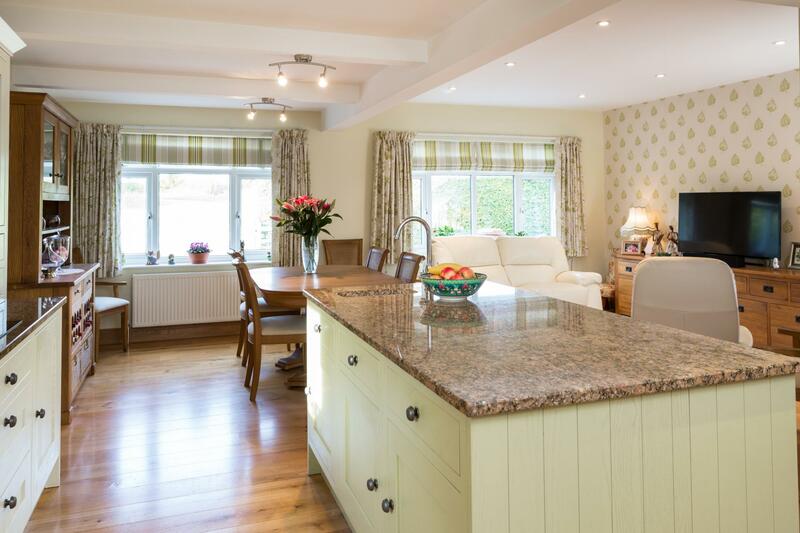 6ft granite island, fitted with a butlers sink and a filtered water tap having cupboard and drawers under, polished oak floor, shelved pantry cupboard with dual aspect windows overlooking the gardens towards a 'Green'. 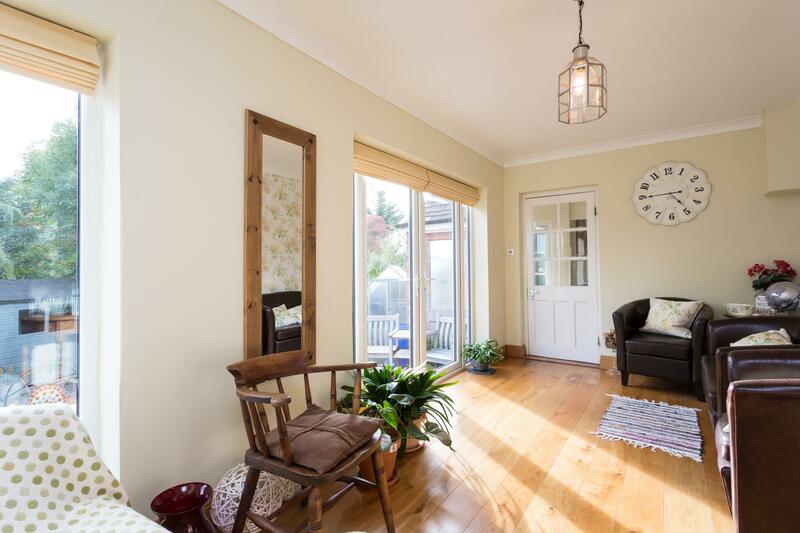 GARDEN ROOM with southerly aspect, polished oak floor and French doors opening to a patio area. UTILITY ROOM with stainless steel sink unit with side drainer, adjoining work surfaces, space and plumbing for a washing machine with further space for a dryer, tiled splash, wall mounted cupboard, boiler cupboard with floor mounted oil-fired central heating boiler and rear access door. SEPARATE CLOAKROOM having a tiled floor, low suite WC. GROUND FLOOR BEDROOM enjoying a dual aspect overlooking the established gardens with views towards the ruinous stone walls of Sheriff Hutton Castle, fireplace with cast wood burning stove set on a stone plinth. 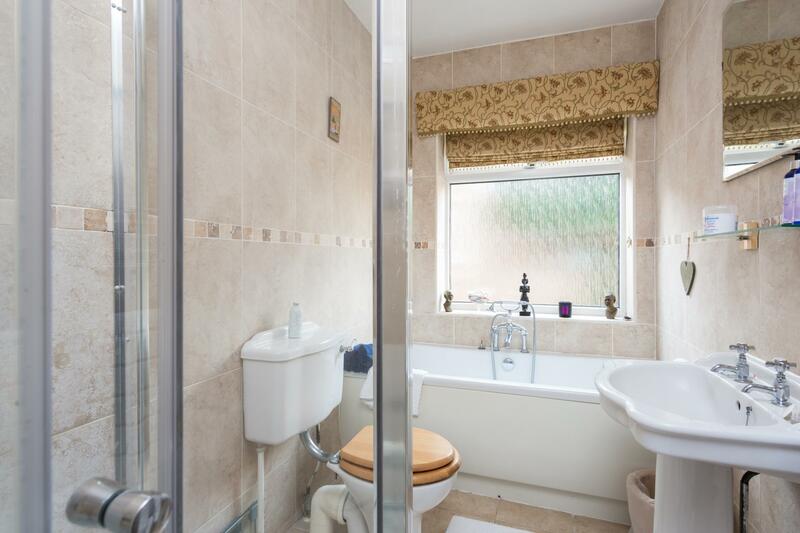 BATHROOM with white 4-piece suite comprising shaped and panelled bath with hand held mixer tap/shower, corner shower cubicle with Aqualisa plumbed shower, pedestal wash hand basin, low suite WC, heated towel radiator and tiled floor. FIRST FLOOR LANDING with Velux roof light and airing cupboard with pressurised hot water cylinder. 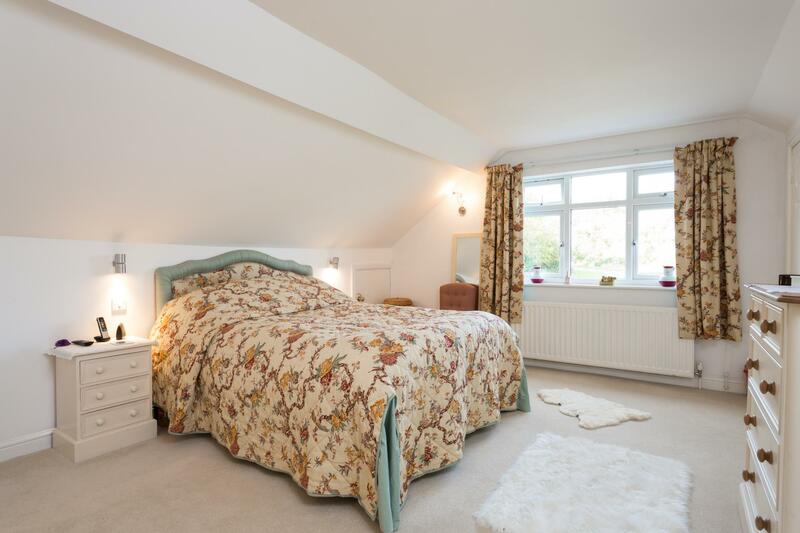 Generous storage areas within the side attic space to both bedrooms. EN SUITE BATHROOM, having half tiled walls, white suite comprising shaped and panelled bath, pedestal wash hand basin and low suite WC. There are 2 further BEDROOMS and access to a loft area (suitable to create an additional BATHROOM). 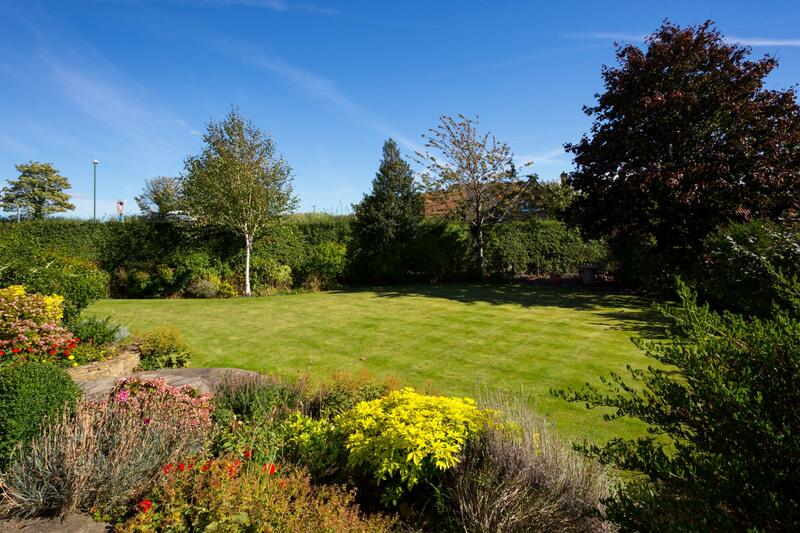 OUTSIDE Litton House enjoys a delightful corner garden position and is within easy walking distance of Sheriff Hutton village amenities. SUBSTANTIAL DETACHED GARAGE 18' 10" x 18' 4" (5.74m x 5.59m) With remote up and over door, personal access door to rear, light and power. LEAN-TO LOG STORE Set behind a high hawthorn hedge and providing privacy, at the front is a generous lawned garden, having shaped borders abundantly stocked with a variety of shrubs and flowering plants including laurel, holly, birch and cherry, with a slated seating area and apple tree. Semi-circular stone steps flanked by raised borders, lead up to the front entrance. To the south side is a stone flagged sun patio, with a low maintenance deck and useful garden store. At the rear is an enclosed courtyard. In all 0.20 of an acre or thereabouts. LOCATION The village of Sheriff Hutton is situated on a long low ridge between the Vale of York and the Howardian Hills with castle ruins dominating the scene. 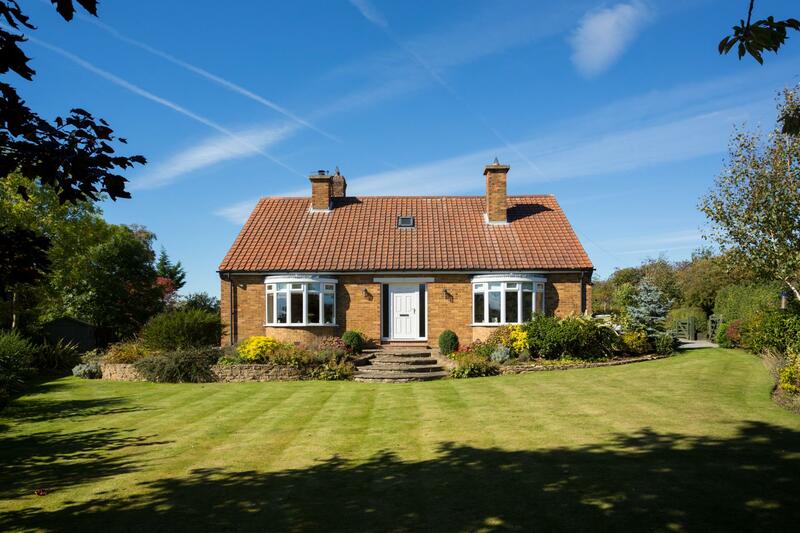 Village amenities include a Post Office/Village Store, two public houses, a delicatessen/coffee shop, wine shop, an excellent Primary School, 12th century Parish Church, Methodist Chapel and Village Hall, with ease of access for travel further afield. SERVICES Mains water, electricity and drainage, with oil fired central heating. DIRECTIONS From Easingwold, proceed out along Stillington Road to Stillington. On entering the village on High Street, proceed through the village and continue down Main Street. Turn right signposted Farlington and proceed along the country road to Sheriff Hutton, whereupon Litton House is situated on the right-hand side, identified by the Williamsons 'For Sale' board. How much will my mortgage be? Williamsons are more than just estate agents - We are Chartered Surveyors and Valuers which means you receive quality advice on the market value of your home taking account of the prevailing conditions. Add in our extensive Marketing Package and personal attention and you have a property marketing service that really stands out from the crowd... talk to us. 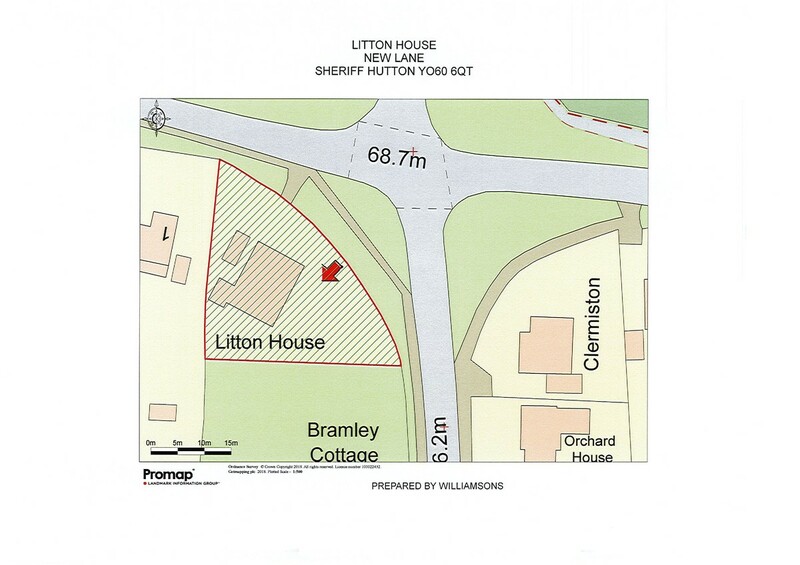 Williamsons Property Limited. Registered in England. Company No: 8209667. 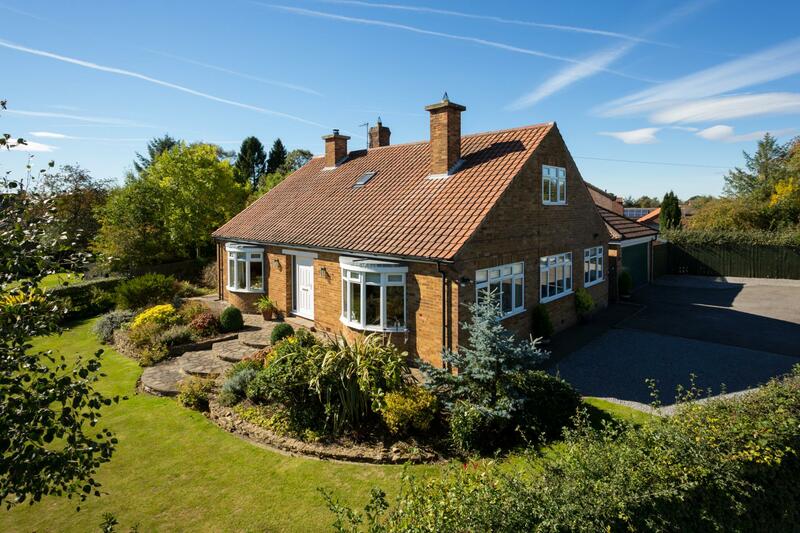 Registered Office Address: Byrne House, Chapel Street, Easingwold, North Yorkshire, YO61 3AE.